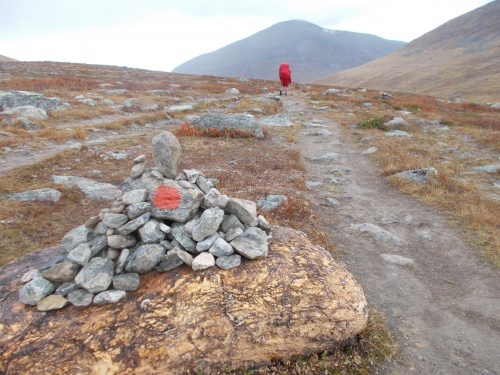 Another Long Walk: Day 29: The Northern Lights Return! Day 29: The Northern Lights Return! September 13: I woke up at about 1:00 in the morning and felt the urge to pee. It wasn't an urgent need, but it was there--a warning shot that said that I might be able to hold it for a few hours, but before the night was over, I'd be forced out of my sleeping bag to take a leak. Ugh! So I was trying to decide if I should do it now and get it done and over with or maybe wait it out for a few hours and stay in my nice, warm sleeping bag. For now, at least. Then I looked out the front of my tarp and saw what was most definitely the northern lights outside. Nope, I definitely needed to pee now--because I was getting up no matter what! 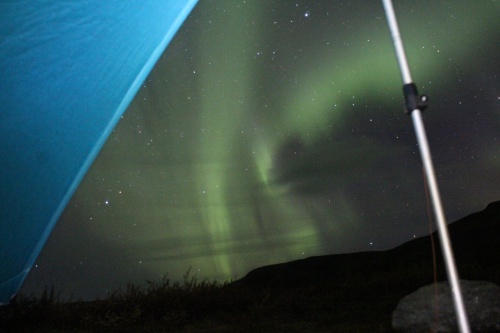 I loved that the I could see the northern lights right from under my tarp. From under my tarp, I could tell there was quite an amazing light show happening! And they were bright! 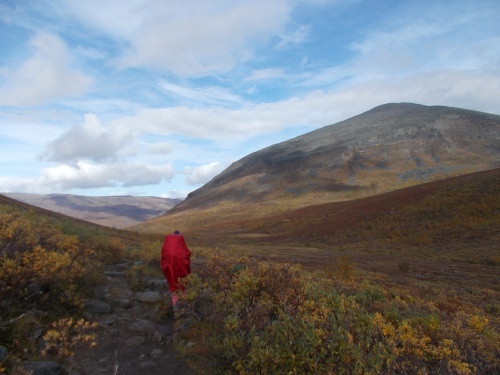 I could see the glowing green color, streaking from the horizon high into the sky from the warmth of my sleeping bag. I didn't need a photo to confirm what I was seeing. I quickly got out of my bag and peed before calling out to Karolina to wake up and get up--there was a show going! The northern lights was a surprise because the weather forecast had called for cloud-cover all night so we weren't going to look for them tonight. Karolina quickly got up and I pulled out my camera to get some photos. 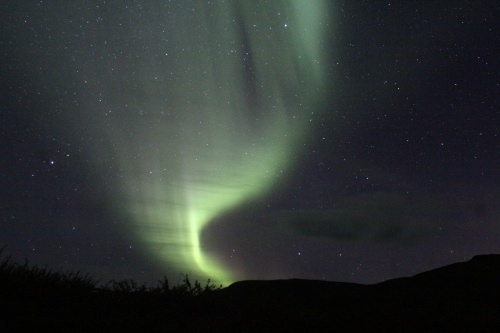 Karolina tried to take a photo with her iPhone, but the northern lights didn't show up in her images at all. Only my fancy camera where I could control the length of the exposure was able to get the visual splendor in the sky, but the aurora was bright enough that I kept it down to 10 to 15 second exposures. A 30-second exposure would have overexposed the images. The curtains of light danced around the sky, brightening in one area, then streaking across the sky to the other horizon before dimming and brightening again. The curtain of light would widen and narrow. It was magic! This was the best show we had seen so far! I tried to take a video with my camera hoping to capture the moving lights, but my video turned out completely pitch black. I couldn't see a thing in it, much to my sadness. My camera could get some great photographs, but it couldn't get a video of the magic. I worked my camera for about 15 minutes, after which I felt like I got enough photos. It was a good sample of what we were seeing, and I set my camera down and enjoyed the show with my naked eye. We watched the lights dance about for about an hour--the best hour of the entire hike, in my opinion. The light show kept going strong, but we were getting more than a little cold standing around watching them. 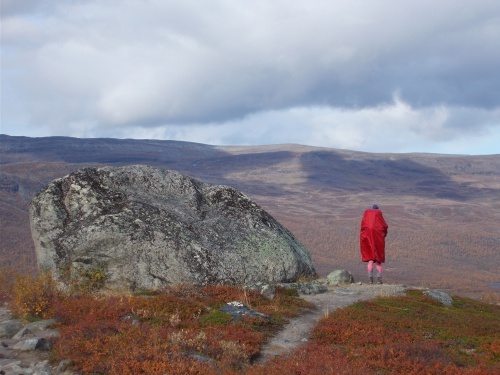 We had all our layers on, but we needed to get back in our sleeping bags. And, we knew we'd want at least a little sleep before the sun finally rose again. So we reluctantly returned to our sleeping bags, but at least I could still peek out from the tarp and enjoy part of the show from under my tarp. I soon fell asleep with the northern lights still dancing about. 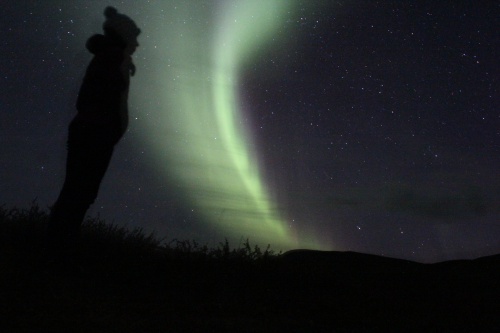 Karolina admires the northern lights. I told her to stand VERY still for this photo so she wouldn't show up blurry. She did well, but she still turned out a bit blurry! It's hard to stay completely still for 15 seconds! 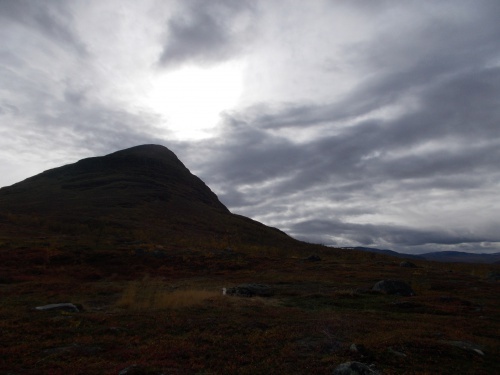 By the time the sun rose in the morning, the skies were overcast and dreary and temperatures were cold. Some of the surrounding mountains, we noticed, had a fresh dusting of snow. Yep, it was time to finish this trail. Winter conditions were right around the corner. We slept in late, again cutting back the miles we could do because we didn't want to finish the trail too early before our flight out of here was scheduled to depart. 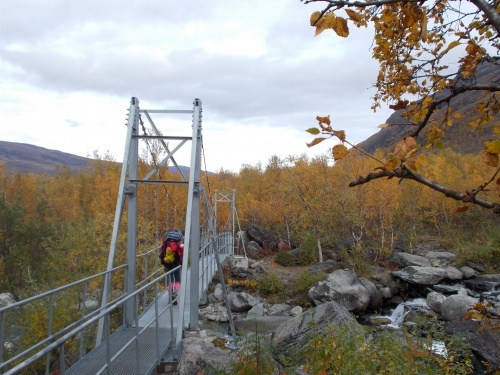 We planned for a short 11-km (6.8 miles) day to a location just before the boundary of Abisko National Park. 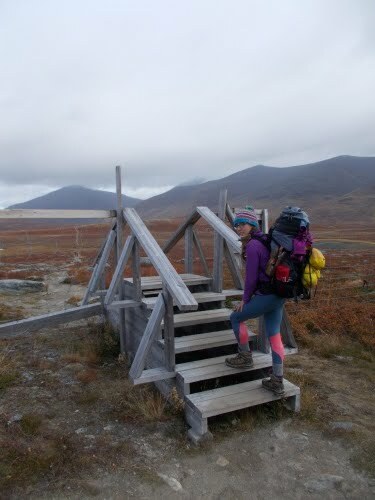 We would stop just before the boundary because Abisko NP is the only place on the entire trail where hikers aren't allowed to camp pretty much anywhere they want. They have to stay in huts or at established campsites crowded with other people, and we weren't sure if those campsites would even be free. Outside of the park boundaries, we could camp for free and wherever we wanted. So our plan was to set up camp before we reached the boundary--probably somewhere close to the boundary. With such a short day planned, Karolina decided to sleep in late and we didn't leave camp until about 11:00 in the morning. 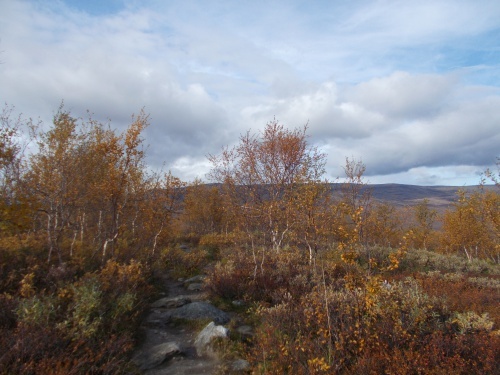 There were a few light sprinkles during the hike, but nothing serious. 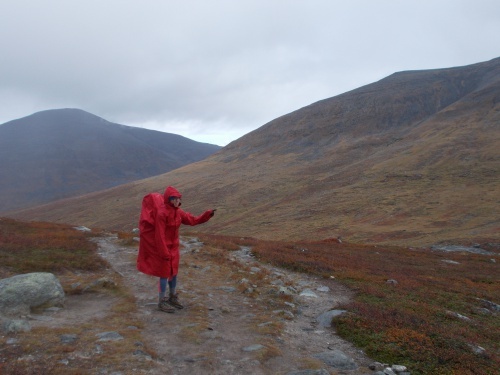 I never even pulled out my umbrella or put on the poncho on my pack. We took a short snack break about halfway through our day's hike and still reached our campsite by 2:00 in the afternoon--a mere three hours after we started hiking. We didn't start the fire immediately. Upon our arrival at 2:00pm, it was a bit early for a fire and not even very cold at the time. We waited several hours before starting the fire and had a positive bonfire the rest of the day and late into the evening. The rain, fortunately, never materialized. 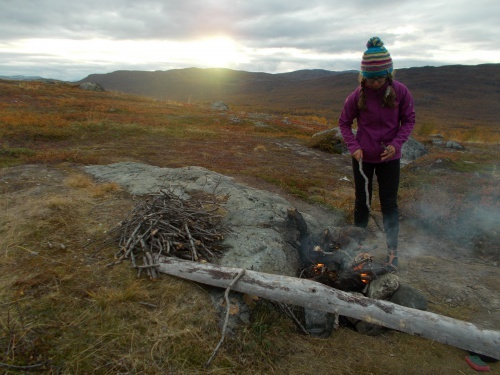 Late in the evening, after we had eaten dinner, put out the fire and headed off to our sleeping bags, I noticed a small rodent sneaking up to me under my tarp. Karolina had already gone to sleep, but I was still awake reading my Kindle and I noticed the rodent out of the corner of my eye, but I couldn't tell exactly what it was. A mouse? A lemming? Something else? I didn't know, but I grabbed a nearby Croc and tried swatting at it to scare it away. It dashed off into the safety of nearby brush. It stayed there for several minutes before sneaking up to a sponge Karolina used for cleaning her cooking pot which she left unattended on the ground, then I saw the sponge walk off! It was bigger than the rodent, and it dragged the sponge along its side, covering the rodent so all I could see was the sponge and a long tail dragging behind it. It looked like the sponge was running off by itself! I yelled to wake up Karolina. "There's a mouse running off with your sponge!" I told her. She didn't seem so interested--she seemed more interesting in sleeping. "Huh? What? Where?" "I just saw a mouse run off with your sponge! Into the bushes in that direction!" "Oh, well..." she said, then went back to sleep. I guess she didn't have a lot of sentimental attachment to the sponge. 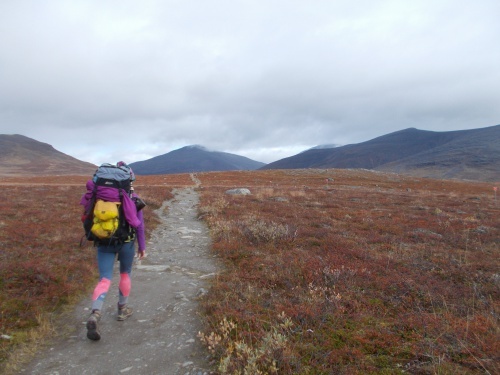 I grabbed the little food I had left--we would finish the trail tomorrow so my pack was gloriously light on food--and stuck it under my legs to discourage the rodent from coming after what little was left of my food. I had a feeling that he wouldn't be interested in the sponge after he took a bite of it and realized it wasn't really that tasty. I didn't see the mouse again after that. Maybe he was satisfied with just the sponge? I read my Kindle a bit more before going to sleep, just as the rain started falling and would continue to do so for most of the night. 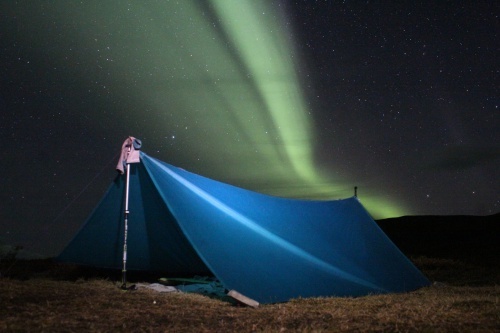 And another northern lights photo--just because I liked the way it stretched over my tarp! =) I had to shine my headlamp on my tarp for a fraction of a second so you could actually see the tarp and not just a silhouette of it. Karolina collects firewood while I... watch? =) This photo is a little misleading. 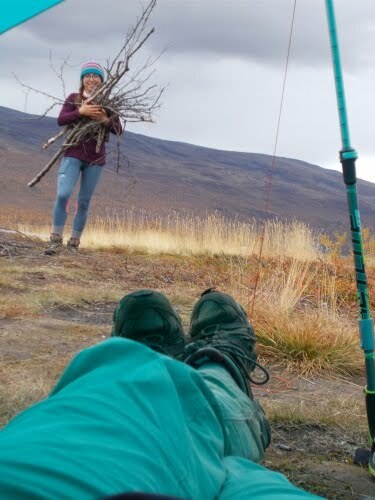 Karolina did collect most of the firewood, but only because I wanted to set up my tarp first. That was a bigger priority for me--it might rain at any time! I took this photo just as I finished setting up the tarp, but I did look for some wood afterwards. 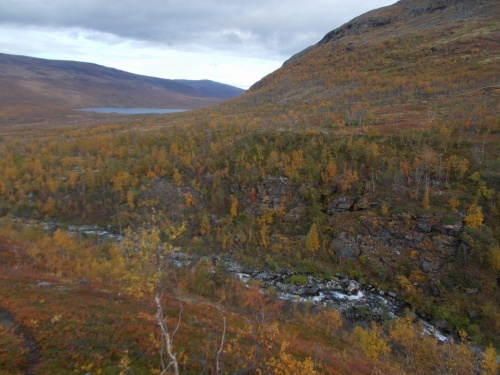 Day 30: The End of the Kungsleden!